FOOD This years primary food focus will be (suprise!) ITALIAN. We'll have a terrific menu of appetizers, soups, pastas, D.I.Y. pizzas and desserts. For the adults, a selection of seasonal cocktails will be sure to please; not to worry, the kids will be delighted by the offerings too! I will be dropping off the menus in mailboxes this weekend. Make sure to sign up (by email, first come basis) what you would like to bring; recipes are included. You may bring additional items as you wish. Signing up is a commitment to your neighbors :) A decorating checklist will also be included for those of you who have already volunteered. 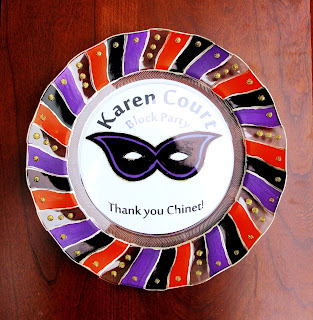 Here's a look at the great Chinet® Cut Crystal® 10" Dinner Plate I've painted. The colors are: black, orange, dark lilac, gold and glitter gold. Most of the paint is on the back except for the gold glitter paint which is on the front rim of the plate (which could easily be on the back and still be beautiful). 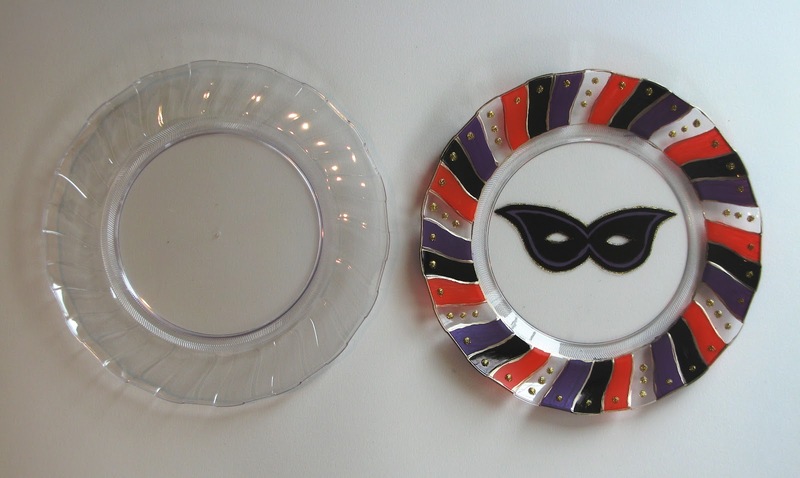 The dessert plates are painted differently but to co-ordinate beautifully. I've shown the original plate to the left above so you can see how the plate began. Below is a detail shot. Check out the upcoming post to view the entire Masquerade Placesetting! 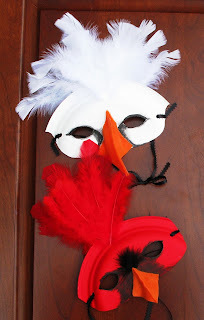 You'll note in upcoming posts how the mask theme and the colors carry throughout. 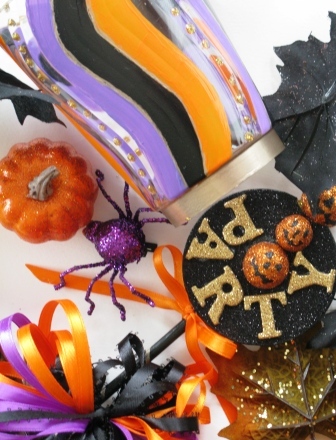 Even though we have the block party in October we (as a neighborhood) like to keep it as a mix between Halloween and Thanksgiving with a real party vibe. And although there are children present it is not ALL about the kids! So the kids will have fun, but the party isn't kid-centric. Rich and Kathy offered to pay for rental tables and chairs this year. Yeah, no more hauling chairs outside. Thank you Rich and Kathy for this generous contribution to our fabulous party. We greatly appreciate it!